Phony domestic "charities" that funnel money to terrorist organizations may have been hobbled by law enforcement agencies cracking down on their activities -- but they still can count on the unwavering support of the Muslim Public Affairs Council (MPAC). Our third installment of the Investigative Project on Terrorism's dossier on MPAC (see part one here and part two here) focuses on its support for those alleged to be connected to terrorists. Be it the Holy Land Foundation for Relief and Development (HLF), the Global Relief Foundation (GRF), the Benevolence International Foundation (BIF) or the Islamic American Relief Agency (IARA), MPAC has consistently defended them and their actions in the supposed interest of civil rights. 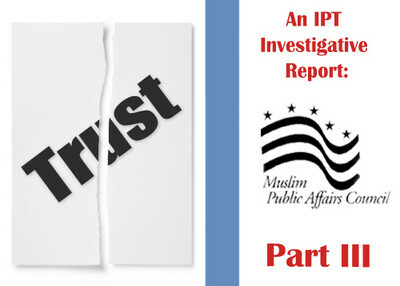 In every case, MPAC has responded to investigations by the FBI and the U.S. Treasury Department with complaints that authorities have not proven their allegations, and variations on the constant themes that enforcement actions unfairly single out Muslim groups and "bear strong signs of politicization." At the same time, MPAC has been equally diligent in defending individual terrorists uncovered by federal investigations. The result of this approach has been to foster mutual distrust between American Muslims and the broader U.S. society, and so to undermine relations between the two. Statements assailing the post-9-11 report by the National Commission on Terrorism, condemning the USA PATRIOT Act, blasting the use of informants in terrorism cases and charging that FBI investigations are isolating the Muslim community have had one common theme: a divisive effort to portray the "war on terrorism" as actually perverted into a "war on Islam." When the Treasury Department in 2001 named HLF as a Specially Designated Terrorist based on the charity's persistent role in funding the terrorist group Hamas -- an action that was to lead to the group's closure -- MPAC leapt to its defense. Treasury Secretary Paul O'Neill had declared that HLF "masquerades as a charity, while its primary purpose is to fund Hamas…This organization exists to raise money in the United States to promote terror." But MPAC had a far different take, arguing in a joint statement issued with seven other Islamic groups that the goals of cutting off funding for terrorism and achieving peace in the Middle East could not be achieved "by taking food out of the mouths of Palestinian orphans or by succumbing to politically-motivated smear campaigns." The statement termed the government's action "an unjust and counterproductive move that can only damage America's credibility with Muslims in this country and around the world and could create the impression that there has been a shift from a war on terrorism to an attack on Islam." In 2008, jurors in Dallas convicted HLF and five former leaders on 108 counts related to their Hamas support. MPAC's reaction was much the same after BIF was shut down by the government in 2001, preparatory to being designated as a financier of terrorism the following year. In an opinion column written for the New York Times, Executive Director Salam al Marayati deemed the action unfair and counterproductive. "The government's policy has inflicted considerable harm," Marayati wrote. "By effectively shutting down these charities, it has given Americans the false impression that American Muslims are supporting terrorists. It has also given the Muslim world a similarly false impression that America is intolerant of a religious minority." Marayati expanded his defense to GRI in another 2002 article in which he referred to "the three American Muslim charities shut down as a result of the government's freeze of their assets." "Selective justice is injustice," Marayati wrote. "It does not help us in the war on terror and continues to project the image that the U.S. is anti-Islam." MPAC's portrayal of the three groups as truly charities was given the lie in multiple subsequent legal proceedings. In one, for example, Enaam Arnaout -- an operations manager for BIF -- acknowledged in pleading guilty to violating the Racketeer Influenced and Corrupt Organizations Act (RICO) that BIF had concealed from donors and the government the fact that a material portion of the donations it received was being used to support terrorists overseas. IARA got its turn at MPAC sympathy after it and five senior officials were named Specially Designated Global Terrorists in 2004 for allegedly providing direct financial support for Osama bin Laden and the terrorist organizations Hamas and Al-Ittihad al-Islamia. Appearing on National Public Radio, Marayati deemed it "a bit disturbing that the announcement of shutting down another charity… [took] place just before the month of Ramadan in the peak of the election season." More recently, with the criminal case scheduled for trial in July 2010, former IARA employee Ahmad Mustafa has pled guilty to transferring money to Iraq as part of his work with the so-called charity. And FBI raids in 2002 on Northern Virginia locations associated with the SAAR Foundation, a network of groups suspected of serving as fronts for Islamic terrorist organizations, drew MPAC criticism as an "assault on the community" that "further isolated and alienated law-abiding Muslims." In addition to the "charity" organizations, MPAC has defended at least a dozen individuals suspected of terrorist activity within the United States. Responding to the indictment of Rafil Dhafir and three others on charges of money laundering and conspiracy to transfer money to Iraq, for example, Marayati pronounced the action "a sham" and expressed the hope that "these people can be vindicated because they did nothing wrong." Dhafir was later convicted and sentenced to 22 years in prison. When 11 members of a "Virginia jihad" network linked to al Qaida and the Taliban were indicted on a variety of conspiracy charges, MPAC suggested there was insufficient evidence to justify the action. Six of the defendants later pled guilty, three were convicted at trial, and two were acquitted. And in one of the most high profile cases, MPAC repeatedly went to bat for Sami Al-Arian, a University of South Florida professor arrested in 2003 for allegedly serving as North American leader of Palestinian Islamic Jihad (PIJ), a designated terrorist organization said to be responsible for the deaths of two Americans and more than 100 Israelis. One typical press release, issued in 2003, demanded proof that the charges against Al-Arian were based on "concrete evidence of criminal activity and not guilt by association or political considerations." In 2005, a Tampa jury acquitted Al-Arian on eight of the 17 charges against him. But, faced with a retrial on the other nine, he pled guilty to "conspiracy to make or receive contributions…to or for the benefit of the Palestinian Islamic Jihad." The plea came barely a month after Marayati had lauded Al-Arian at a benefit banquet as a man who "defied the odds in a system that is unfair," adding, "[T]here is no way that you can get a fair trial in view of any of these issues today." Based on its record, the odds seem substantially longer against MPAC shedding its stance as a perpetual apologist for terrorists and their financiers. Part three of our MPAC report can be read in full here. How about charity to Pakistan? How about the charity by US government to the biggest terrorist organization in the world, Pakistan? Those billions of dollars are being used to kill American troops in Afganistan. All Roads Lead to Jihad? Interesting that the new sharia-compliant Master Card found at www.shariapaycard.com offers zakat to charities that include MPAC, ISNA, Islamic Relief and several US mosques. Some are identified as "unindicted co-conspirators" in the HLF case. They do provide a disclaimer that these "charities" have been checked against the 'Office of Foreign Assets Control' to not be associated wtih terror-sponsoring organization. If the head of this hydra is the Muslim Brotherhood, then all are sponsors of jihad and any sharia-compliant financial instrument in the US constitutes ongoing treason against this nation and its citizens. See www.shariapaycard.com/charities... if it is still available. I have a screen shot from 2-10-10.